Through a culture of excellence, professional commitment to our mission and adherence to our value system, we will demonstrate in every decision, with every contact, that the members of the Onondaga County Sheriff’s Office are among the finest public servants in the Nation. 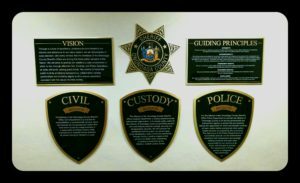 We will strive to provide our residents a safe environment in which to live, through effective Civil, Correction, Custody, and Police Operations, all while efficiently utilizing public funds. We commit to honor the public trust by employing transparency, collaboration, valuing partnerships and providing dignity to all to ensure operations consistent with the values of a free society.